This post has been the most clicked-on photo from my Feeding Time Blog Pinterest board GREATEST HITS – so I thought I’d bring it to the front page of the blog. The recipe comes from The Steading cafe in Keith, Scotland where I tried their homemade oatcakes on a ploughman’s lunch and they were amazing. Served in place of bread with cheese, their oaty crunch complemented the meal perfectly. I have used oatcakes on my cheese plates before but I’d never thought to eat them with things like smoked salmon, clapshot (like a tasty mash potato with turnips and chives) or maybe even with something sweet like butter and jam for breakfast. They’re a great alternative to bread, if you’re looking to reduce your processed flours. As these oatcakes are made with no flour and not much butter, they make very healthy snacks with lots of fibre. If you’re wondering what bran is, it’s the husk or outershell of the oat grain. Bran contains lots of fibre and minerals and looks like little flakes almost, and is sold in packets usually in the cereal aisle. But you might have to search a bit, they’re not usually on eye level. If you introduce these children perhaps with their favourite spread or topped with cheese, it might become their favourite cracker and one of their best sources of fibre. Angus and Maggie from The Steading, were kind enough to let me use their recipe for home made oatcakes. Roll out and cut circles as you would with normal cookie dough. Bake on lined trays until golden brown and getting crisp around the edges (around 20 minutes, but keep watch). Leave to cool for five minutes on the tray and then transfer to a wire rack. I’ll probably try to make these next week since there’s no sugar so it’s low G.I. Too bad that healthy snacks like this are not sold as often as the sugary sweets! I’ve been looking for a recipe for a recipe for Oaten Cakes for years! I’m so happy that I came across yours. I made them this morning and they turned out great! I ended up baking them longer than the 20 minutes. What I wanted was a wheat free cracker, so I brushed them with a beaten egg and sprinkled them with seeds and course salt. Very delicious! (I left a few plain to see how the original ones taste. Great recipe, thanks for sharing. Thanks for sharing this! I’m so pleased you had success with this recipe. I recall that I too cooked them a little longer, I suppose it makes a difference how thick you roll them and how hot your oven is. I bet the seeds and salt worked beautifully – what a great idea! I love oat cakes! I hate driving an hour to the one store that carries the Walker brand at $6 a box. My inner “Scott” cringes at the wanton waste. These are amazing! THANK YOU. I have my second batch in the oven right now. I use a beurre noisette just to bring a richer flavor. So great to hear that this recipe has worked for you. They’re so much better than anything you can get from a box! I’ll never forget that cafe in Keith where I first tried them. How lucky too that the chef was so kind to share the recipe! Nice idea Janet, glad you’re enjoying the recipe. It’s been one of the most popular on my blog. Do these keep well? Should they be refrigerated? Can they be frozen? I don’t imagine they would. Home-made biscuits are usually best eaten ASAP…no preservatives to keep them fresh. In the freezer they might take on water and lose their crunch. Perhaps you could try and let me know? 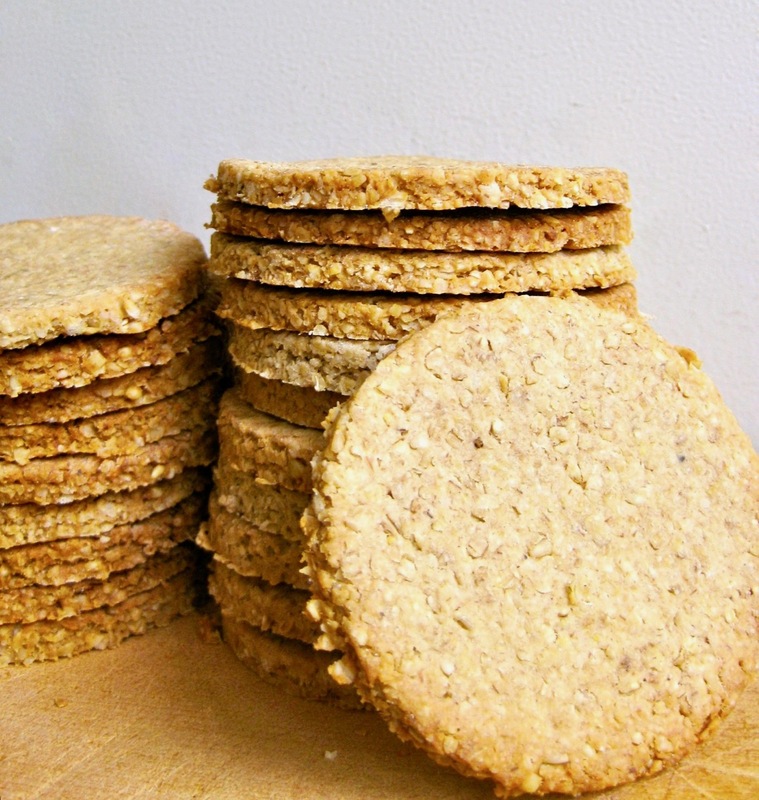 Thanks for this wonderful recipe.I’ve been looking for something similar,without sugar and flour,for a long time and I must honestly say that these oatcakes are fantastic: simple ,delicious and easy to make. That’s wonderful that you’re enjoying them Delia. To be honest, I don’t remember, this post was so long ago. I guess it depends on how thick you like them. Sorry I can’t be more help. I would like to serve this at an afternoon tea. I’m wondering what type of cheese you eat with this and would you serve it with smoked salmon (do you add anything else to the 2 items)? Hiya – it’s been a while since I made these… but I recall they make quite a few, maybe 20? It all depends how thick/thin you roll/cut them.